Congratulations to Greg Hobson, Winner of Event 49: $1,500 Ante-Only No Limit Hold'em ($256,691)! Three days ago World Series of Poker history was made when this unique event kicked off. It was a standard no-limit hold'em event with one key difference: no blinds. Players would ante every hand and have the option to bring in for the smallest denomination chip in play. After three days of play and a field of 939 players, Greg Hobson was able to rise to the top to grab the first place prize of $256,691 as well as the first WSOP bracelet offered for this type of event. When Day 1 of this event began kicked off, many were excited about the unique play that this structure of tournament would offer. What was not expected was how quickly the field would fly. The starting 939 was whittled down to the final 110 after just ten levels of play on Day 1, which was enough to make the money. Among those to come out for the event and go home without a cash were Daniel Negreanu, Barry Shulman, Joe Cada, Matt Glantz, Dennis Phillips, David Williams, Jennifer Tilly, Christian Harder, Phil Hellmuth, Randy Lew, and many more. The pace of the tournament did not slow down on Day 2 when the final 110 returned to the felt. Dan O'Brien, Jeff Williams, Mickey Petersen, David Chicotsky, Max Pescatori, Melanie Weisner, John Racener, Men Nguyen, Mike Leah, and Erick Lindgren were among those to return for Day 2 only to hit the rail before the final table. Day 2 ended after a little more than eight levels of play as a final nine were reached. Play at the final table began just as fast and furious it had been for the first two days of the tournament. Justin Schwartz became the first casualty, however, when he was unfortunate enough to run his into Greg Hobson's during a preflop all in confrontation. Schwartz flopped a gutshot Broadway draw but was unable to hit it and was sent to the rail in ninth place. Soon after Schwartz's elimination Sameer Aljanedi got it all in with before the flop and was called by eventual champion Greg Hobson's . Hobson paired his queen on the flop and that was all she wrote for Aljanedi. Play slowed down after this for what seemed to be the first time in the entire tournament. This lull in the action ended, however, when Harrison Gimbel got his stack all in against Seth Davies. Gimbel was way behind with to Davies' pocket queens. Davies' hand held up all the way until the river when the hit to give Gimbel a pair of aces. A crippled Davies was the next to go when Harrison Gimbel finished off his short-stack during the next hand. Mike "Timex" McDonald was the next player to be eliminated from the field. McDonald moved all in before the flop and was called by John Hayes. Hayes was in the lead and jumped into an even more secure place when he flopped top set on the flop. The board paired fives on the turn and McDonald was drawing dead. Timex collected $39,931 for his sixth place finish. 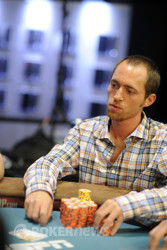 Eugene Du Plessis was the chip leader coming into play but remained quiet for a majority of the final table. Eventually he moved all in before the flop holding ace-king but was sent packing when Greg Hobson's ace-queen drilled a queen on the flop. Harrison Gimbel was the next to go when he showed two pair against Mike Sowers. Sowers held a better two pair and Gimbel was out the door. Immediately after Gimbel's elimination, John Hayes moved all in with pocket sevens on a flop. Mike Sowers called with for top pair and Hayes failed to improve. Hayes' third place elimination put Greg Hobson and Mike Sowers heads up with virtually even chip stacks. Hobson came out to an quick lead winning two substantial pots early on in heads up play. Sowers was able to fight back a little but in the end it just was not enough. About thirty minutes after returning from the dinner break, Sowers moved all in with and was snap called by Hobson's . The board fell and Sowers was forced to settle for a second place finish and $158,887 in prize money. PokerNews sends its congratulations to Greg Hobson as the champion of the first ever Ante-Only No-Limit Hold'em event in World Series of Poker History. That does it for our coverage of Event 49: $1,500 Ante-Only No-Limit Hold'em. 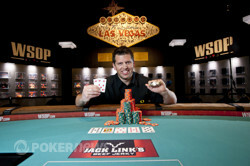 Be sure to check out our live reporting page for more updates from the 2012 World Series of Poker! Mike Sowers had the button. Greg Hobson was the bring in for 30,000. Mike Sowers moved all in before the flop and Hobson snap called. Hobson was ahead and needed to fade an ace to clinch the win. The flop obliged and Sowers was two cards away from being sent home in second place. The turn brought the and Sowers still needed one of the three remaining aces to continue heads up play. The dealer produced the on fifth street and Sowers was sent to the rail with a second place finish. Sowers will take home $158,887 for his efforts. Greg Hobson brought in for 30,000 and Mike Sowers raised to 70,000 from the button. Hobson called and the flop was . Hobson checked and Sowers fired 105,000. Hobson called. Both players checked the turn and the river. Hobson tabled for a flopped pair of tens and took down the pot. Cards are back in the air for this heads up battle. Here are the heads up chip counts as of the dinner break. Players are now on a 60-minute dinner break. Play will resume in an hour! Greg Hobson had the button and both players saw a flop for 20,000 a piece. 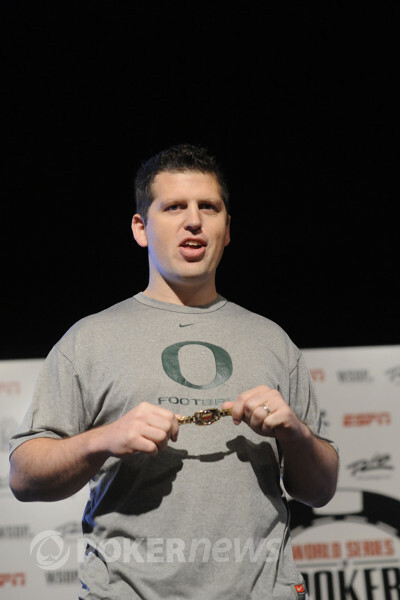 The flop was and Hobson fired 50,000. Mike Sowers raised to 130,000 and after about twenty seconds Hobson replied by announcing that he was all in. Hobson had Sowers covered and Sowers decided to muck his hand and look for a better spot. Mike Sowers had the button. Greg Hobson was the bring in for 20,000 and Sowers raised to 60,000. Hobson opted to re-raise, making it 190,000 total. Sowers called. The flop was and Hobson continued for 170,000 only to find a call from Sowers. Both checked the turn and when Hobson checked the river, Sowers shot out a bet of 360,000. Hobson quickly folded and Sowers took the pot.